One of my most popular blog posts to date has very little to do with making or preparing food. It’s about children at the table. I wrote this post just over a year ago, lamenting about diners becoming incensed over children sharing the same space as them in a restaurant. I also wrote about things we’re teaching our son, Liam, when it comes to behaving at the table at home, and when we’re out to eat. In terms of dining out, it seems like customers aren’t the only ones peeved at tiny tots eating out. Restaurants have also gotten into the act, like this Pennsylvania restaurant that banned children under 6 from eating at its establishment. They’re not the only ones to do so, but I still think it’s a non-story. It’s a little silly to take your toddler into a fine dining establishment. And by fine dining, I don’t mean your local family restaurant. I mean a very nice, fine dining restaurant. Or, if you do take them, take them at a reasonably early hour when they won’t be disturbing other customers. Does this make you want to order takeout? You're not the only one. It’s a fine line to walk, and we’ve certainly been caught in situations where we had to choose to either take kids or stay home. The first Mother’s Day we celebrated, Liam was only 7 months old, and Buck really wanted to do something special and celebrate by taking me to a wonderful dinner at a 5-diamond restaurant (the now defunct 1 North Belmont), one we had been dying to try. Unfortunately for us, we couldn’t find a sitter. Buck wasn’t willing to give up, though, and talked to the manager. They moved our reservation to the first one of the late afternoon (I think it was like, 4:30 or something ridiculous like that), and Buck promised him that if our son even so much as made a peep, he would immediately take him out of the restaurant. The manager was skeptical but agreed, and we had something on our side – that was also Liam’s naptime, and we hoped he would sleep right through it. I was very nervous because I’m the type of person who really follows rules and etiquette. I knew it could go wrong so many different ways. Miracle of miracles, Liam slept in his carrier behind my chair (in a dark corner we had picked) through the whole thing, and we enjoyed a wonderful meal. But the truth is, I probably wouldn’t ever do that again. It was nerve-wracking wondering if he was going to wake up and start making noise. I see absolutely nothing wrong with an establishment setting the rules for children. There are resorts where they request that small children under a certain age not eat dinner in their upscale restaurants, and it’s not a big deal. Plus, there are also lots of other options at those resorts for kids to eat. I see nothing wrong with that whatsoever. Those restaurants are meant to provide a certain experience, and they can’t accomplish that with screaming toddlers in the mix. On the other hand, I still firmly believe that it’s important to teach our children how to behave when they eat out at nice restaurants. I think there's a balance in there somewhere, and it starts with parents who are willing to take the time to teach their children how to behave. 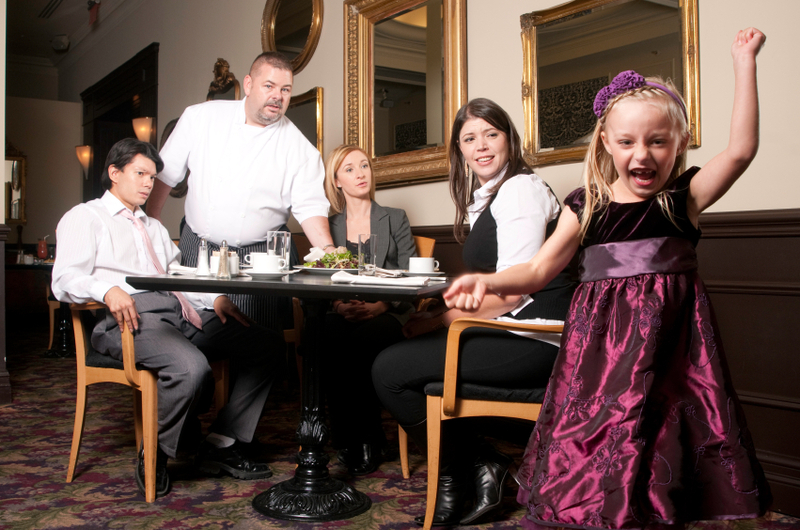 I applaud establishments that welcome young diners, but set rules and expectations for them. Like The Homestead, where young diners are welcome to eat in their two best restaurants, but are expected to look presentable, and boys 12 and up are expected to wear ties and blazers. I still stand by what I said in my original post: If we don’t teach our children how to behave at the table when it’s time to go out to eat, how will they know what to do when it really matters? What will they do when it comes to their very first important business dinner meeting? Part of that process is actually going out with the kids and giving them the chance to experience it. I want to know that when my children go over to someone else’s house, or they go out to eat at a restaurant – any restaurant – they’ll know how to behave. It takes a lot of work to get there, and it hasn’t always been smooth going trying to get Liam to fall in line this past year, but that’s my next post. So what do you think, readers? Are you up in arms that kids are being “banned” from certain restaurants? Or do you think it’s the establishment’s right? Sound off in the comments! I don't know how I feel about them being banned--I don't feel strongly one way or the other. In some settings, as you suggested, I think it's fine. Reason #1 is that we hardly EVER go out to eat. We just don't have the cash and if we do, it's on a date with just me and Rob and that's the best use of any money set aside for eating out. If we're going to do it, I want to do it on a date, enjoying his company. Reason #2 is that my boys both are ridiculously active. I know many of you (and for sure you, Jenna) have boys, and so you're saying, "Well, duh, they're all active." Yes. But even from an early age with Sawyer, he was out-activing the normal kid his age. He's not super hyper or anything, but just BUSY. I've been astounded watching other kids doing things that he never did at the same age (like sitting still), because I just thought we were normal. I'm not using this as an excuse, but more of a reason that I want to wait. We are very firm with discipline and definitely have taught him to behave, but certain situations at this time would just be too much of a temptation or struggle and I don't think would be fair. As he has gotten older, his ability to really sit and eat a meal and talk with us (at home or, as I mentioned in #1, rarely out at a restaurant) has grown. We have taught him manners and are working with him on those pesky three year old behaviors. We do a lot of things that he doesn't want to do, so it isn't that we don't try things just because they're hard or he won't like them. But it's one of those things where we try to find the balance between putting him in a situation that is almost unfair because of its specific challenges to him at that stage, if that makes sense.